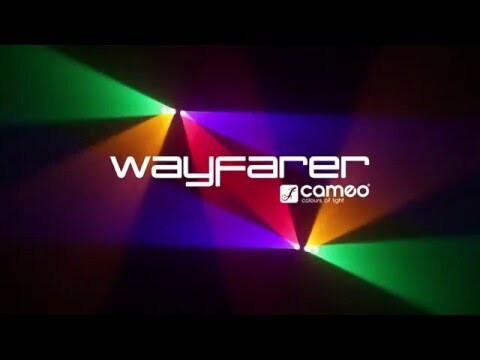 The Cameo Wayfarer is a top-flight four-eyes derby matrix light with a total of 16 RGBA 3 watt LEDs that are individually DMX controllable. Creating a rich palette of exciting colours and impressive effects, the fixture sports a heavy duty metal enclosure with efficient convection cooling, safety eye and adjustable mounting bracket. With 4 modes of DMX control, convenienent infrared remote, sound activation, built-in automated programs and master, slave and standalone functionality the Wayfarer provides flexibility in a wide range of lighting applications. The multi-voltage unit operates on 100 – 240 volts and features a backlit 4-button display for easy operation. 3-pin DMX and IEC power inputs and outputs facilitate daisy-chaining.